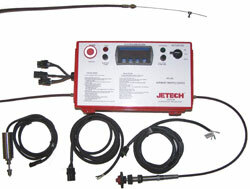 At JETECH, we take precision seriously. Our completely electronic Automatic Throttle Control (ATC) systems are accurate and reliable. Controlling dump system and maintain constant pressure is important to efficient and quality in completion of water jetting projects. Our ATC-500 units are designed to control a mechanical engine throttle, and can be fitted to virtually any existing unit, operating at virtually any pressure. Our ATC-600 Automatic Throttle Control unit is designed for electronic engines, and can be incorporated into the latest engine control modules.